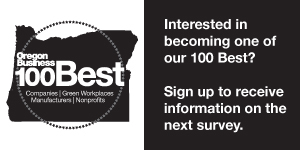 The 100 Best list recognizes large, medium and small companies for excellence in benefits and compensation, work environment, decision-making and trust, performance management, and career development and learning. The winners were revealed at the 100 Best awards dinner and are published in the March 2016 issue of Oregon Business. The complete list winners in three size categories are below.